Enterprise edition Financial Accounting Software is all-in-one accounting management program for small or large business firms. With additional barcode supportive feature, utility allows to manage the entire financial details of any organization at one place. Software efficiently creates and maintains Company profile, Customer-Vendor records, Stock-Inventory records, Tax type details, Sale-Purchase records and other fiscal reports. The barcode feature helps to streamline business workflow by providing fast and accurate accessing of product details and eliminates data duplicity. Easy to use accounting program helps to run business more professionally and provides comprehensive solution with eliminating the need for paper. User-friendly program does not require any expert guidance and easily useful for both novice and business professionals. Program helps to improve performance and efficiency of your business and easy access to accounting books accurately within minimal time. Easily creates new Company profile with capability to maintain customers/vendors records. Barcode supportive feature facilitates safe, secure and fast recognition of financial and accounting records. Manages business accounting details including voucher entries, stock, inventory, invoice, sale/purchase records, tax type etc all at one place. 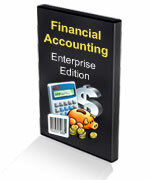 Facilitate computerized generation of printable balance sheets, trial balance, profit/loss records, and other accounting records. Maintains multiple tax accounts (Sale Tax, Service Tax etc) with Tax Account Nature, Tax Type and Tax Class. Creates simple and easily understandable Sale, Stock, Purchase and Production reports. Facilitates users to manage and work with multiple currency formats as per requirement. Manage entire business operation at a single host system. Facilitates administrator to create, modify or delete multi-user account. Useful for small to large business organizations. Provides option to save financial data at desired location. User can easily Enable/Disable barcode settings as per need. Cost-effective and affordable to use.